If you are interested in learning more about our new hot forming titanium press or any of our other services, fill out the form below! Hot forming is a matched metal tool forming process that relies on time, temperature and pressure. Depending on the product being formed, those working directly with the product will determine the proper temperature of the blank, tool, and the pressure required to form the component. 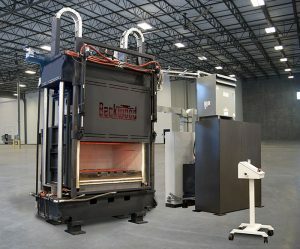 Why Is Titanium Used for Hot Forming? The aerospace industry is a major user of titanium in their products. In fact, two-thirds of the amount of titanium produced is used exclusively in aircraft engines and frames. This may be because the metal itself is known for its high strength (30% stronger than steel and 100% stronger than aluminum) and low weight (50% lighter than steel). With a solid resistance to corrosion and the highest strength-to-weight ratio of any metal, titanium is a good choice within the industry for jet engines, firewalls, missiles and other aviation-related products. Utilize Our Hot Forming Titanium Press Today! At Cutting Dynamics, we’re always looking for ways to go above and beyond as leaders in the aerospace industry. To do so, we purchased a brand-new hot form press from Beckwood Corporation. The press offers our customers a number of advantages, such as significantly reduced lead times (12 weeks) and an in-house team that can design and manufacture all the required tools and fixtures. We would love an opportunity to take a look at any of your applications today. Simply fill out our online contact form or give us a call at 440-249-4150 for more details and information. We look forward to hearing from you to discuss your company’s goals.